The following article is excerpted from Healthy Aging® Magazine. To continue reading this article and to try more of the recipes, subscribe to Healthy Aging® Magazine, the lifestyle magazine that is all about following your passion and what you can do rather than what you can’t. With summer in the rear view mirror, many of us are ready to head back to the kitchen with the determination to make, serve, and eat healthier foods more than ever before. Certainly, the fall months seem to make us clamor for comfort foods with gatherings of friends and family. Now, the spotlight is all of that with the emphasis on healthy. If you used the summer to get in shape, you are ahead of the game and are ready to tackle the fall and holiday food extravaganzas. If you didn’t or if you don’t want to slip back, we have some new books for you to use as resources. All are guides to preparing healthy meals that are perfect for the season and all year long. Chances are you have a cast-iron skillet that you’ve had for years but have not used in a while. It’s time to bring it out of retirement and revisit its special qualities, making it a perfect choice for simple one-pot meals. 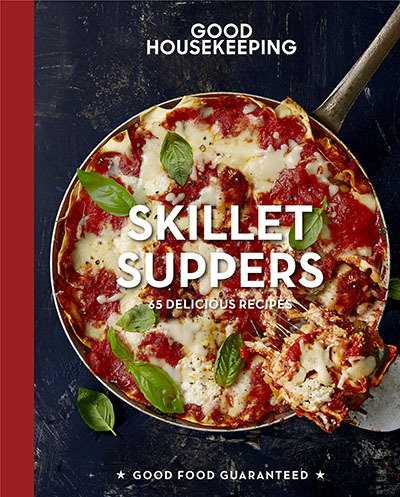 The Good Housekeeping Skillet Suppers 65 Delicious Recipes is a terrific resource for everything you need to know about your cast-iron skillet from how to season or re-season it, how to easily clean it, and what to cook in it. This is a must-have fall book for ideas ranging from steaks and chops (try Steak Pizzaiolo, a juicy steak dinner with sautéed onion, red pepper, and diced tomatoes) to rice dishes (try Creole Fried Rice with smoky andouille sausage, rice, and beans) to seafood (Mediterranean Cod, a light seafood recipe bringing together zucchini, spinach simmered in marinara sauce, seasoned with garlic and red pepper). 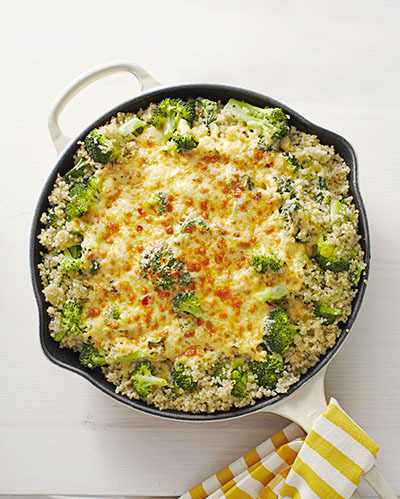 For a meatless entrée, try Baked Pepper Jack Quinoa Skillet, a creamy quinoa skillet casserole of broccoli, spinach, and perked up with pepper jack cheese. In covered 5-quart sauce pot, heat quinoa and water to boiling over high heat. Cook as label directs. Add 8 ounces small broccoli florets to pot 5 minutes before end of cooking time. Cook until broccoli and quinoa are tender. Drain quinoa mixture well; transfer to large bowl. Add spinach, sour cream, garlic, salt, and pepper; toss to combine. Preheat broiler. Spread quinoa mixture in 10-inch oven-safe skillet; sprinkle with cheese. Broil 5 to 7 inches from heat source for 3 minutes or until cheese melts. 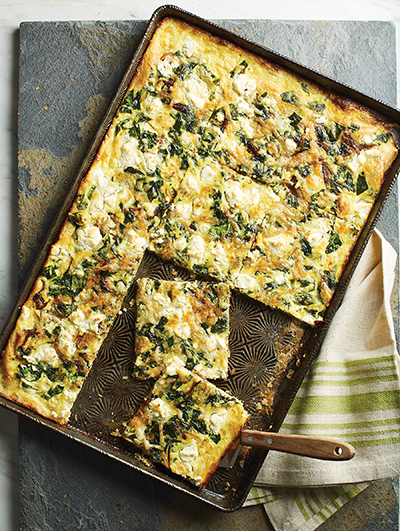 Reprinted with permission from Good Housekeeping Skillet Suppers 65 Delicious Recipes, ©2017 by Hearst Books, an imprint of Sterling Publishing Co., Inc. Hardcover. Another must-have kitchen tool is a sheet pan. Professional cook and recipe writer Raquel Pezel provides a complete resource guide, Sheet Pan Suppers Meatless: 100 Surprising Vegetarian Meals Straight from the Oven for how to use one of your most basic pieces of equipment in ways you probably haven’t thought to try before. Pezel takes you from soups and entrée to desserts, all of which can be made in the sheet pan. Here are three we especially like … For all three recipes, subscribe to Healthy Aging Magazine. Spinach, Roasted Root “Petals,” Pistachios and Honey Vinaigrette is a hearty salad potpourri of radishes and beets, roasted until they look like beautiful flower petals, tossed with spinach and pistachios, and seasoned with a warm, gingery honey vinaigrette. Lentil and Spinach-Stuffed Squash Halves could become a new addition to any Thanksgiving menu—if you dare step away from the classics. Hollowed out delicata squash or zucchini halves become the vessel for an herby stuffing of lentils, mushrooms, and spinach. Best of all, you don’t have to clean up your cooktop with these recipes. Just use your mighty sheet pan for one-dish meals and use your spare time reading a new book or following your passion! Adjust an oven rack to the lower-middle position and preheat the oven to 300°F. Place the red onion on a rimmed 10 x 16-inch pan and drizzle with olive oil. Toss with the thyme and spread into an even layer. Cover the sheet pan with aluminum foil (you may need 2 sheets), crimping it tightly around the edges to seal, and roast the onions until they are soft, about 20 minutes. Uncover the pan, stir, and continue to cook until the onions are very soft, sticky, and golden brown, 15 to 20 minutes more. Remove the sheet pan from the oven, sprinkle the onions with 1/2 teaspoon salt, and transfer them to a plate to cool completely (reserve the sheet pan and any grease or seasonings left in it for later). Lightly flour your work surface and put the puff pastry on top. Lightly roll out the pastry to between 1⁄8 and 1/4 inch thick. Transfer the pastry to the reserved sheet pan—it should just cover the bottom. With a fork, prick the dough all over, then place the sheet pan in the refrigerator while you make the filling. Whisk the whole eggs and egg yolks to combine in a large bowl. Whisk in the milk and cream, and add the remaining 1/2 teaspoon salt, and the pepper. Remove the crust from the refrigerator and sprinkle half the Gruyère over it. Add the onions in an even layer and then the spinach followed by the remaining Gruyère. Pour the egg filling over and crumble the goat cheese over the top. Bake the quiche for 10 minutes. Reduce the oven temperature to 375°F and continue to bake until the filling is set around the edges and bounces back to light pressure in the center, 20 to 25 minutes. Turn the broiler on to high and adjust an oven rack to the top position. Move the quiche to the top rack and broil until browned, about 1 minute (watch the quiche closely as broiler intensities vary). Remove from the oven, slice, and serve warm or at room temperature. 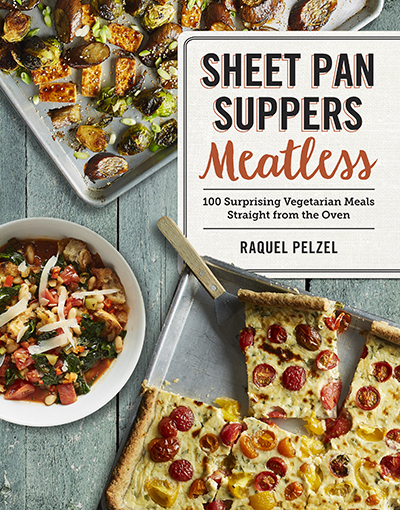 Reprinted with permission from Sheet Pan Suppers Meatless: 100 Surprising Vegetarian Meals Straight from the Oven by Raquel Pezel. ©2017 Workman Publishing. Softcover. The above article is excerpted from Healthy Aging® Magazine. To continue reading this article and to try more of the recipes, subscribe to Healthy Aging® Magazine, the lifestyle magazine that is all about following your passion and what you can do rather than what you can’t.